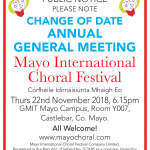 Please note that the Annual General Meeting of the Mayo International Choral Festival will take place at 6.15pm on Thurs 22nd November, GMIT, Castlebar, Co. Mayo (and not 19th October as previously advertised). All Welcome. Details for the 2019 festival just announced! Click on the Syllabus below. 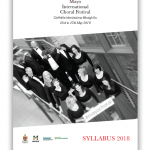 We are delighted to announce the full 2017 festival programme – Mayo Sings in May! Click on the pic for an overview of the festival. A Major Choral and Orchestral ‘Concert of Peace’ featuring the RTE Concert Orchestra, a 120 member choir and soloists Anne Marie Gibbons and Owen Gilhooly. The concert on Saturday May 14th will be the inaugural concert at the newly refurbished Knock Basilica, and will include excerpts from ‘The Armed Man’ by Sir Karl Jenkins, and an Elegy Suite for 1916 by Hollywood composer, Patrick Cassidy, originally from Mayo.